I haven't done a empties post in a while, I just kept forgetting to save the empty containers. But after getting my closet set up, I put this little black basket up and started throwing all my empties in it. DKNY Be Delicious: This was a gift to me... I have had it for about 3 years and finally used it up. That should tell you something. It is not my kind of scent. Giving perfume to someone can be tricky, unless you know what they like. Will NOT repurchase. 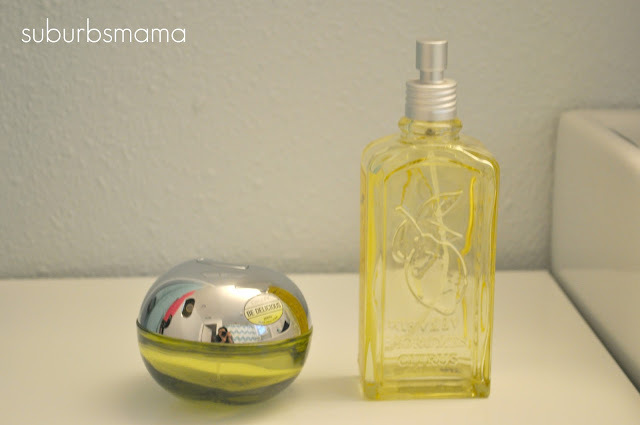 L'Occitane Citrus Verbena: This is my favorite summer fragrance. It smells like lemons and sugar. It reminds me of DG light blue. But so many people I know have that perfume, so I tend to go for this one. Will repurchase. Burt's Bees Very Volumizing Shampoo and Conditioner: On my long search for the perfect sulfate free shampoo I tried this one. I did not like it. It doesn't lather well, leaves hair dry, it certainly does not volumize as it claims. Will NOT repurchase. Carol's Daughter Monoi Repairing Shampoo and Conditioner: I finally found it! The perfect sulfate free shampoo! It lathers well, doesn't strip my hair, it smells amazing and the conditioner is very conditioning, it leaves my hair silky. With this shampoo I am now able to go 2-3 days without washing my hair. Already Repurchased. 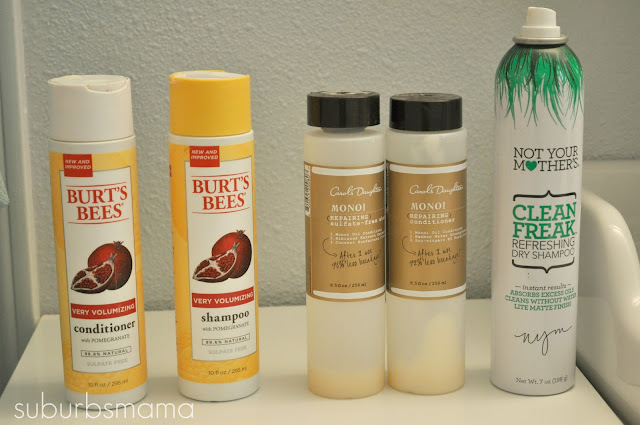 Not Your Mothers Dry Shampoo: This is probably my 3rd can of this stuff! It is amazing for those people with thin, oily hair. I use this on my roots 2nd and 3rd day after washing. I shake the can up, spray it in my roots, leave it in while I do my makeup or get dressed. Then I take my fingers and rub the dry shampoo in until all the white powder disappears. It soaks up all the oil and gives me volume. 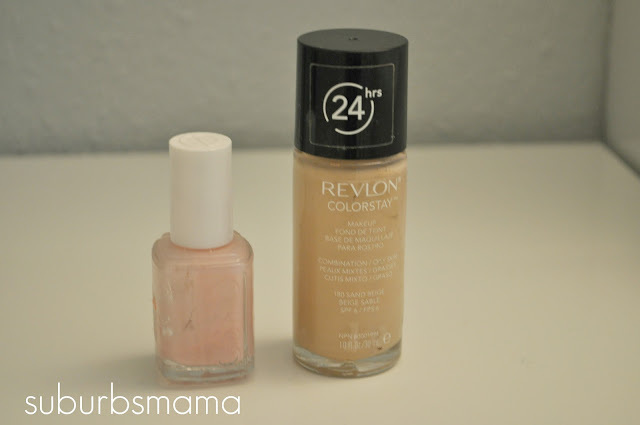 Revlon Color Stay Foundation: I have hate/like relationship with this foundation. I love the coverage and the fact that it is long lasting. I hate the smell (it smells like paint) and the fact that it causes me to breakout. Every time I wear it, I breakout! Anyone else experience this? Although I already repurchased this, I am scared of using it again, since my skin has been doing so well lately. Kiehls Ultra Facial oil free cleanser: This came in my Kiehls 3 set pack from Nordstrom. This face wash really cleans the skin, in fact my skin felt striped and tight after using it. Which cause my pores to produce even more oil. I prefer a face wash with some sort of acne preventing ingredient, and this does not have anything in it. Will NOT repurchase. Clarins Toning Lotion: I got this sample from Nordstrom. It is a great toner. It is alcohol free, plant based, with vitamins and chamomile to sooth the face. Already repurchased full size. Kiehls Blue Herbal Cleanser: I LOVE this cleanser. It is oil free, non drying. It has salicylic acid, cinnamon bark and ginger in it. It gives your face a tingly feeling. It works great with my clarisonic. Allready repurchased. 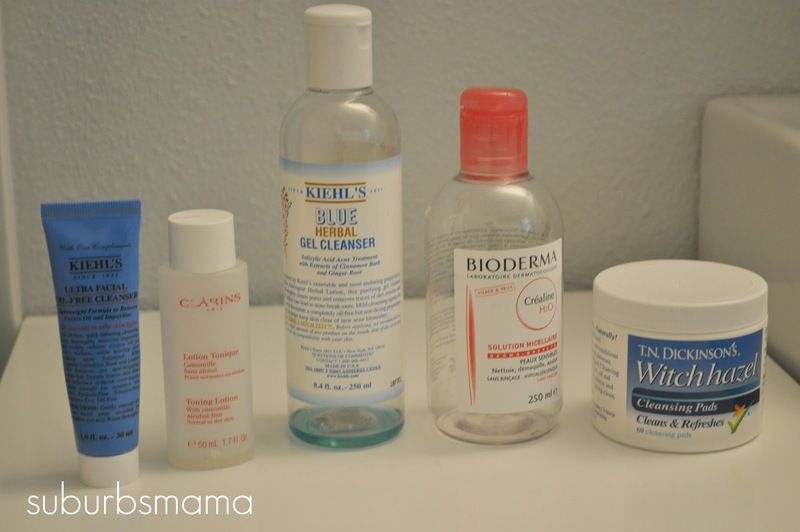 Bioderma Makeup remover: This is my favorite makeup remover at the moment! I used to use purity as a makeup remover, but since stopped when I discovered this stuff. I use two large cotton rounds and remove all my eye/face makeup. Then I continue to wash my face. 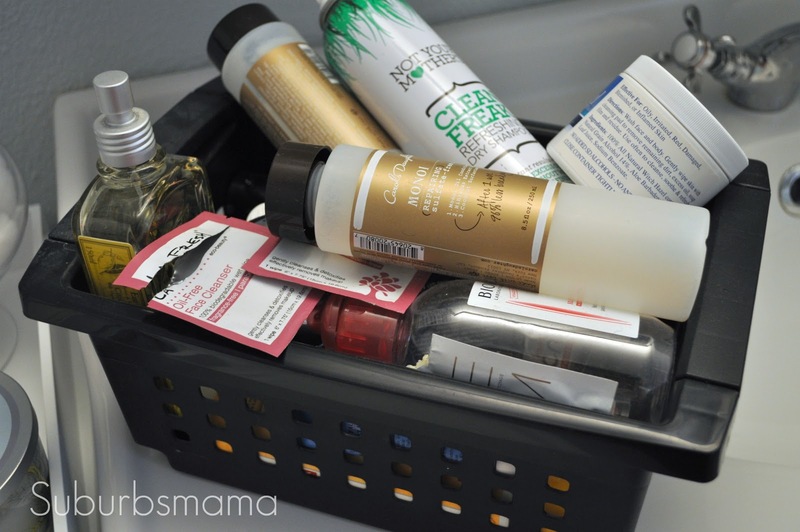 It takes everything off without leaving a oily residue like most makeup removers do. TN Dickinsons Witch Hazel Cleansing Pads: I bought these at my whole foods, I used it to refresh my face in the middle of the day. It says that it is for oily, irritated, red, damaged, blemished skin. It says it cleans and conditions the skin. This was alright, it was convenient to pull out a cleansing pads instead of using a toner with cotton balls. But I won't be rushing to repurchase these. 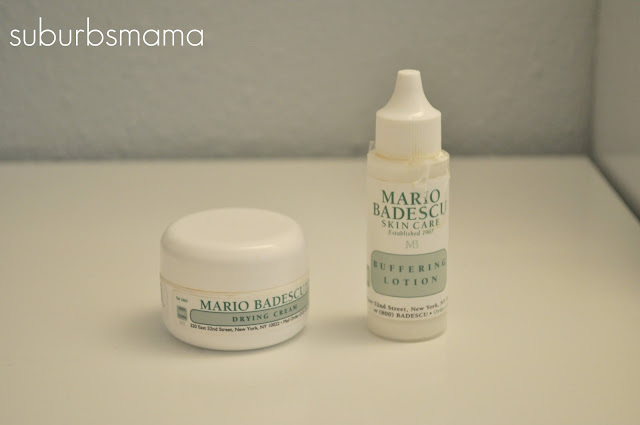 Mario Badescu Buffering lotion and drying cream: After years of trying to find something that will help with my acne. I finally did! I no longer "suffer" from acne. I just get an occasional pimple here or there, which can be easily dried up with these two amazing products. I used the buffering lotion on my chin when I had big cystic pimples, those breakouts took forever to heal. The buffering lotion caused them to completely disaper within a day or two! I don't have deep cystic breakouts anymore, but just in case, I will always have the buffering lotion in my medicine cabinet. The drying cream is truly amazing, two of my sisters tried it and they are hooked. You can use during the day (under makeup) and at night. Just take a tiny amount and rub it in. It may seem pricey, but both of these lasted me 3+ months. Which is more then I can say for some drugstore spot treatments. I just want to say that I usually get lots of breakout during my "time of the month" since using this stuff I get about 2 pimples and they are gone within 2-3 days! Go read the reviews on this stuff if you don't believe me. Its amazing! Already repurchased both. Evelom Cleanser: This came with a muslim cloth to wash my face. I was very excited to try this out, since the reviews are so great. But as soon as I used this stuff, my face got really red and I got throbbing feeling all over my face. I don't know if I am allergic to it or what. I quickly rewashed and toned my face with my usual cleanser/toner and my face was back to normal. Will not repurchase. Sprout All Natural lip balm: This is the BEST lip balm I have ever used! It is all natural, made with only: organic cocoa butter, beeswax, organic coconut oil. It literally melts onto your lips upon contact. It kept my lips from being dry or chapped this month. I already bought the set with 4 different balms. I am currently using the lemon one. I can not recommend these enough! Already repurchased. Whish Shave Cream: The smell of this shaving cream is very strong. And the $20 price tag for a shaving cream is not something I am willing to spend of shaving cream. I will continue using my body wash to shave my legs. la Fresh Oil Free Face cleansing wipes: I haven't used makeup wipes in a long time, mostly because they felt very "soapy". However these two little sample packets where wonderful! They are 100 % biodegradable, fragrance free and paraben free. One wipe takes off my eye and face makeup. I already purchased the full size pack. Well thats all I have for today. As always, thanks for visiting and I hope you have a great day. I have heard so much about Bioderma, but haven't had a chance to try it. Been trying to use up my MAC cleanse off oil, which is heaven for taking off eye makeup. Thank you for sharing. 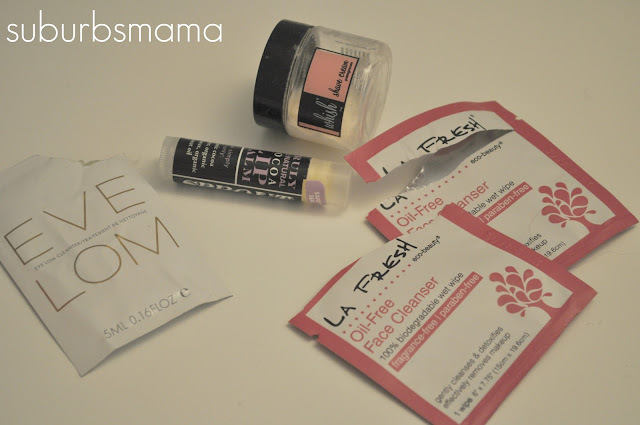 I have a post on best beauty finds in 2012. Hope you have time to check it out. I have this crazy idea maybe we could do a colab and do a products we have repurchased at least 3 times or would repurchase? Please please consider it. Yes, I heard about bioderma and finally decided to try it, I am so glad I did! I can see what the hype is all about. I would love to do a colab post! Sounds fun. So what exactly is Muslim cloth? That cracked me up other then that great post. LOL, it is a small piece of cloth that you need to scrub your face with.